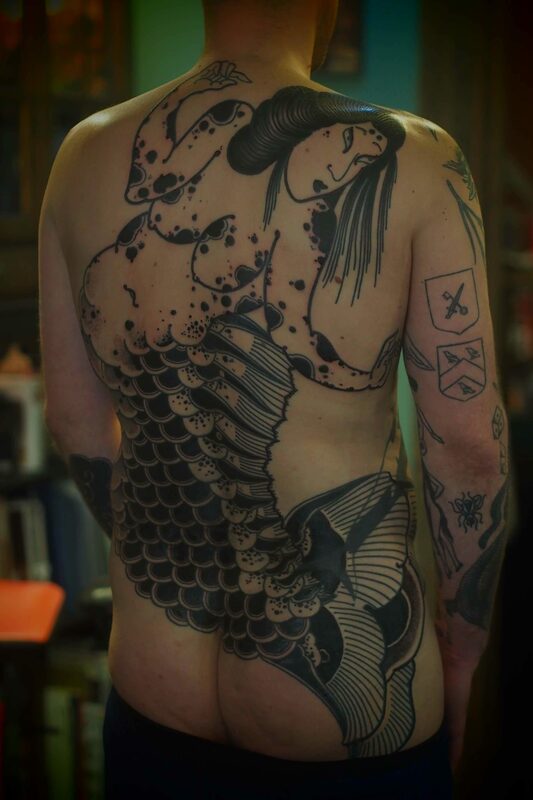 Damien J Thorn's monumental neo-Japanese tattooing strays from traditionalism, leaning more on striking power in both its scale and cold-blooded imagery. Born in Toulouse in 1984, Damien grew up in an "average town" and describes himself as a child of his generation—developing his visual language from comic books and manga. 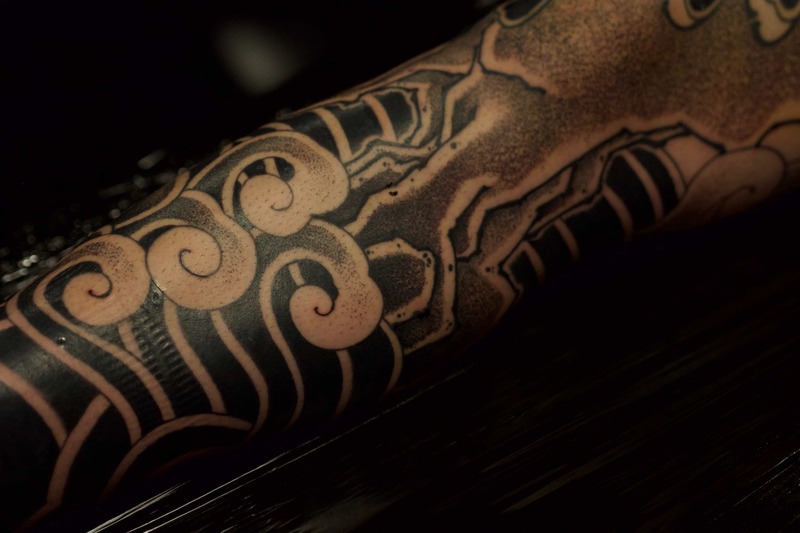 In the interview that follows, Damien discusses the opening of his studio Electric Dragon, the many forms his tattooing has taken since picking up a machine, and how his emotive work—though littered with horror—aims to retain a prominent vein of elegance. What is your name, birthplace, and year of birth? Damien J Thorn. I was born in 1984 and raised in Toulouse, in the south of France. Where did you grow up? Please describe your upbringing and sociocultural background. My childhood in Toulouse was nothing special. I was an only child in an average family who lived in an average town. I’m a child of my generation: I used to watch too much TV as a kid, and grew up on manga and comic books. There was a lot of drawing involved in my childhood. Where do you currently work? Prior to that, where have you worked? For the past two years, I’ve worked out of my own studio, Electric Dragon. I found a place in Biarritz, Basque Country. Not everyone wants to take the responsibility of owning a shop, but for me it was a challenge that I found interesting in many ways. I started in Toulouse and kept moving. 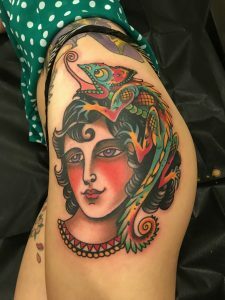 I tattooed at La Boucherie Moderne in Brussels, Lowbrow in Montpellier, Turbo Zero in Nantes, Hand in Glove in Paris, and then I settled in London at Sang Bleu for a while. I’ve also guested here and there, most recently at Gakkin's private studio in Amsterdam. Officially, it’s been seven years. I say “officially” because I consider the beginning of my apprenticeship to be the starting point, but I really started three years before that—tattooing out of my home while I was still a student. It was pretty chaotic. 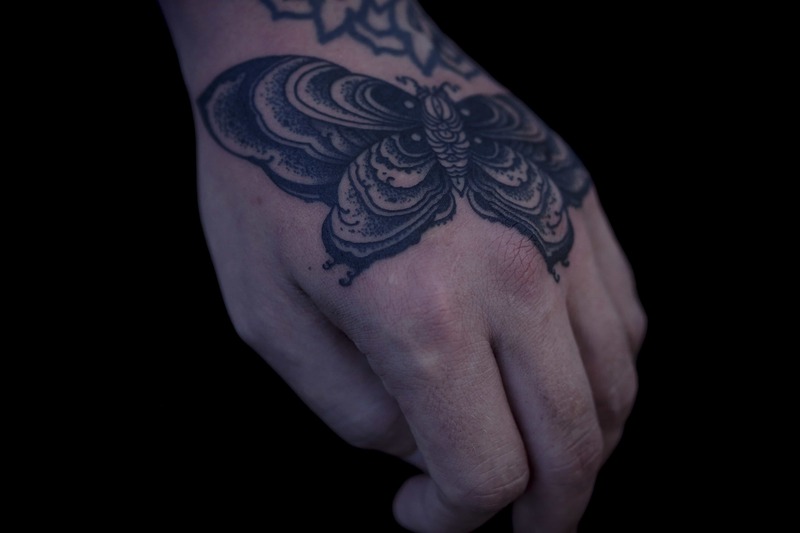 I’d never seen anyone tattoo before, and the only tattooer I’d ever heard of was Yann Black. I didn’t understand anything about the process at all and, moreover, finding good gear when you are not a professional is nearly impossible. 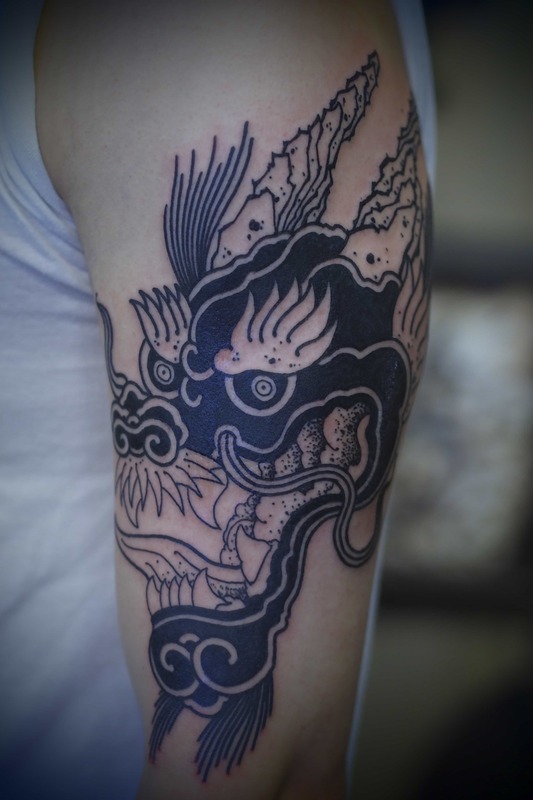 What inspired you to learn tattooing, and what did you initially learn how to tattoo? The sketch-like style of Yann Black was popular at the time, so I was asked to do a lot of line-based work. When I began, my drawings were too wild and illustrative. I had a lot to learn about what makes a tattoo work. I was studying in this small school, and everyone learned that I was tattooing out of my place. For many, it was an opportunity to get a free tattoo! At the time, there were only street shops; private studios didn’t exist as we know them today. In my case, the work was literally homemade. One day, I actually got tattooed myself, and that was the real beginning. The possibility of an apprenticeship followed fast. It quickly became a passion. I’m currently in a Japanese period, and I can’t move on. 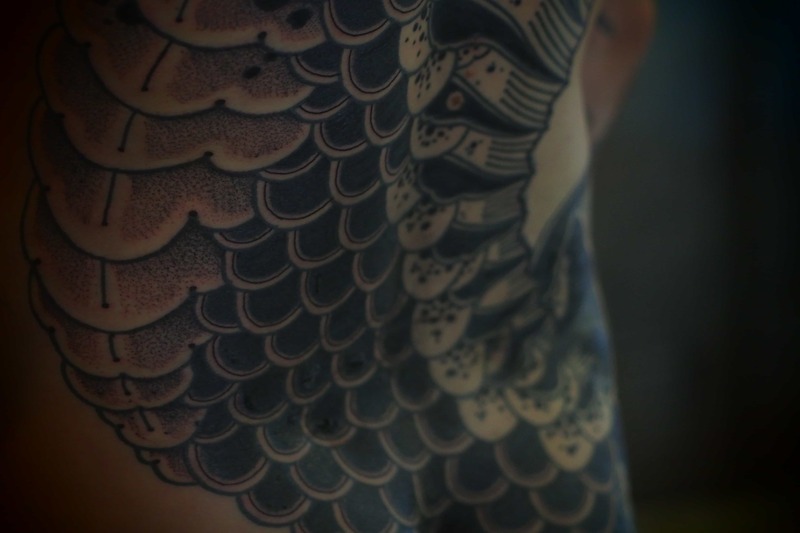 My goal is not to climb inside the skin of a Japanese tattooist. I’m a big fan of the culture, but I wouldn't want to mimic that which influences me only to do a worse job. My goal is to bring a new point of view to what has come before me. How did you develop your style? How would you describe it? What are your influences? It’s hard for me to express the root of what I do. From where I stand, it's as if observing a distant landscape. I see creativity as a long journey where you are either observing or absorbing everything you see—from the details of a fabric to the seam of a car seat. It's all useful. Sometimes there are lines you cross, and what used to be an effort for you becomes natural or fluent—lines and movements become easier. But I get bored very easily. Every time I feel I understand something better, I want to discover something new. 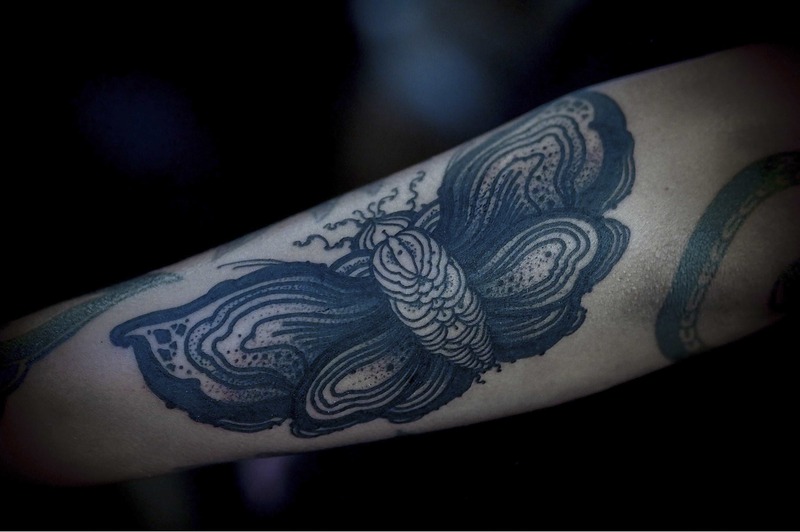 When I first learned to tattoo the notion of “blackwork” didn’t exist, but with me everything had to be dark. That’s how I learned and how I was taught. It was a trademark more than a style. I produced work inspired by engravings for a long time, but when a style becomes too popular, it scares me. It’s not pejorative, I just like the idea of exploring. I’m always looking for something new. I’m currently in a Japanese period, and I can’t move on. 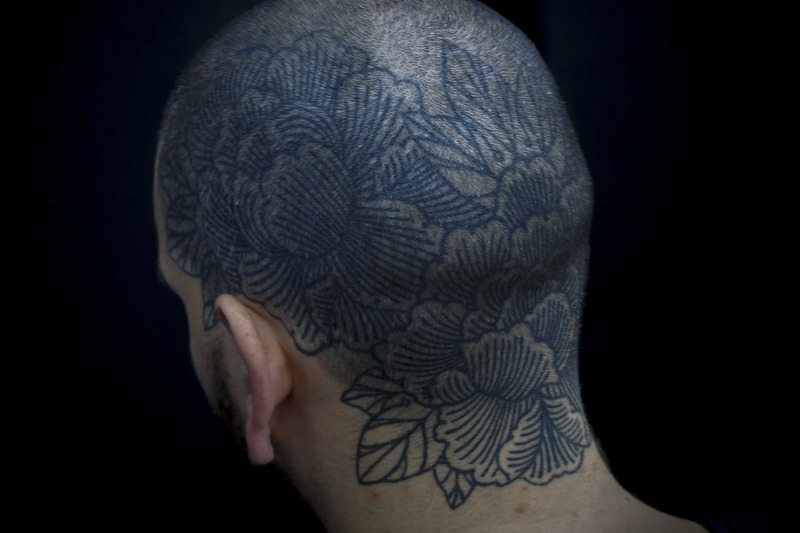 My goal is not to climb inside the skin of a Japanese tattooist. I’m a big fan of the culture, but I wouldn't want to mimic that which influences me only to do a worse job. My goal is to bring a new point of view to what has come before me. Even if I am producing work involving dark or gory subject matter, I want it to be carried with as much elegance as a peony. I’m just trying to bring a little of my culture to a style that already exists. It’s like introducing a new spice to a local dish: it doesn't change everything, but can offer a new flavour. What do you look for in a shop? In the US, I discovered shops that work in an “American” way, where there are a lot of artists working in one space. This means there are often a lot of strong personalities, but you can also feel the shop spirit. I think a good shop has spirit before anything else. Personally, I care about atmosphere. If I feel good in a shop, you can see it in my tattooing. That’s what I loved about my time in America. I loved the atmosphere out there, and I wanted to bring that back with me to France. That’s why I opened Electric Dragon. 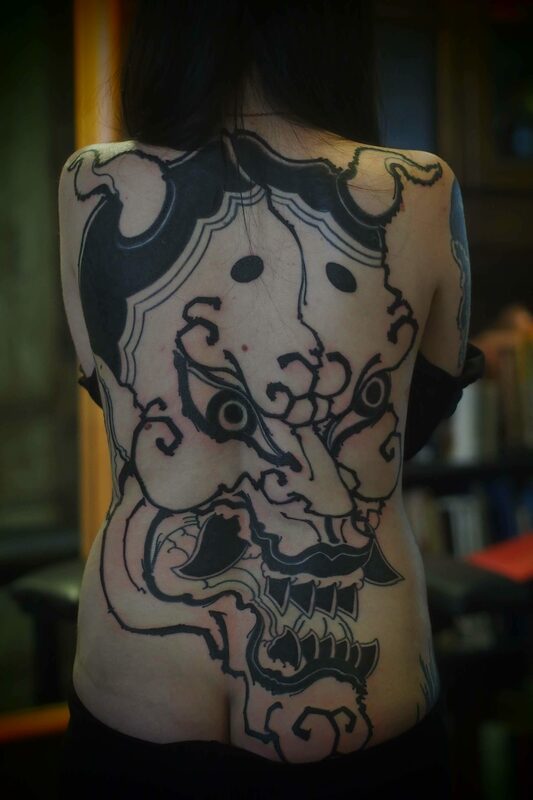 When I first learned to tattoo the notion of “blackwork” didn’t exist, but with me everything had to be dark. That’s how I learned and how I was taught. It was a trademark more than a style. Is traveling important to you? If so, where do you usually travel? Do you have any interesting experiences you can share? Yes! Traveling is maybe one of the most extraordinary things I’ve had the opportunity to do. It’s paradoxical, because I used to be afraid to leave my town, but one day I randomly took the most important journey of my life with a friend: a three-month road trip across the US. It was therapy for me. So much changed. I didn’t uncover any profound answers or whatever, but the journey changed one thing for certain: I was not afraid to travel anymore. Now it has become so important to me, and with tattooing it allows me to meet great artists and discover more than I ever could without it. Are any other forms of media, traditional or digital, important to your work? I have to say that the main media outlets I engage with are digital. There are no filters, which can be both a good and bad thing. 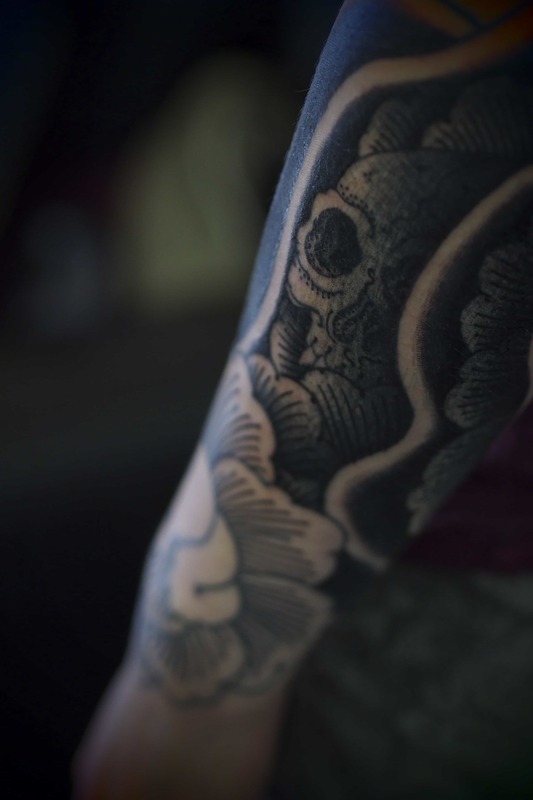 If we call tattooing a culture, it’s hard to see what’s really behind anyone's work. What I mean is that influence and followers are not the best proof of quality, but without social media platforms I wouldn't be able to work. 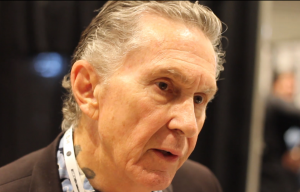 What is the main challenge of tattooing today? I don’t know if there’s a real challenge today because I don’t see an absolute to tattooing. Of course, technically and professionally, you have to keep doing your best while aiming for the highest of quality and originality. I think a tattooer needs to keep trying to evolve as an artist in a more personal way, and in that sense everything is its own challenge. Maybe the most important thing to me is to exist as a tattooer without being a fleeting sensation. Trends don't last. I try to create timeless work—to keep evolving, to not fall asleep. 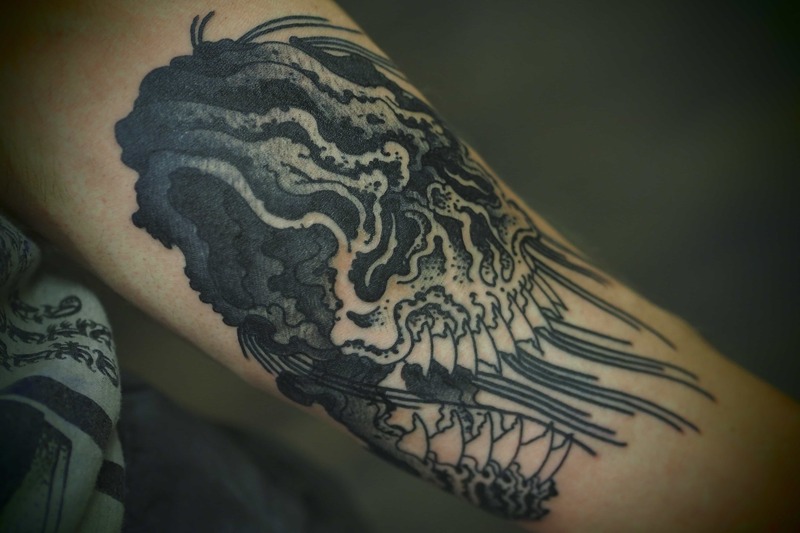 Ideally, how would you like to see tattooing evolve? How do you think it will evolve realistically? I’m generally not interested in talking about myself or the way I see things, but I will always defend tattooing. 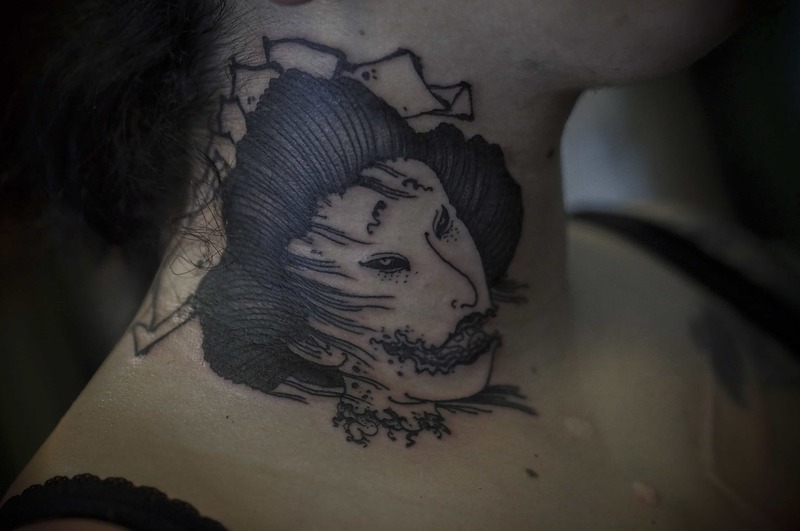 There are historic tattooists—geniuses! You follow their work and witness them bloom. They work well, and thanks to them everything keeps evolving! 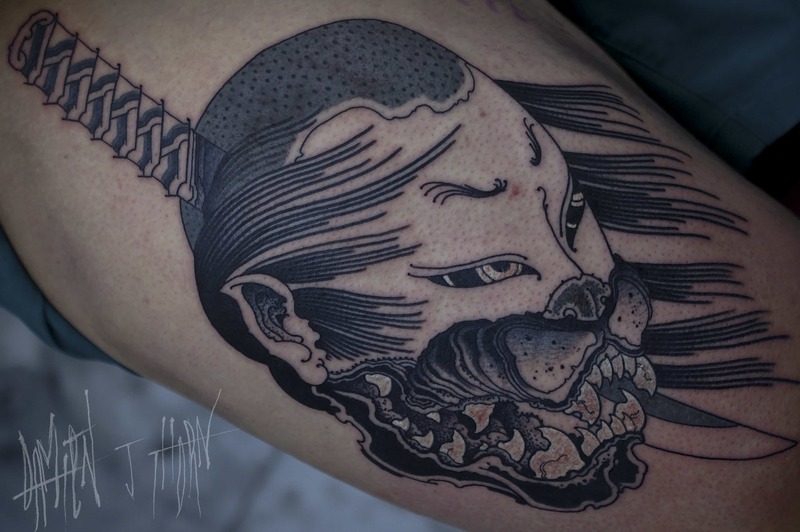 Ideally, I would love to see less ego in tattooing. I mean, your work speaks for you. There’s no need to look after your legend. You can find Damien J Thorn on Instagram (@damien.j.thorn) and online (damienjthorn.com).